A sparkling swimming pool is a gorgeous thing to behold. It makes a backyard look great while providing an oasis from the heat – and a centerpiece for that summer barbecue. All of this clean pool action comes with a price: many hours spent cleaning, brushing, scooping, and testing the water like some kind of recreational scientist unlocking the mystery of fun. Although maintaining a pool can often seem impossible – no matter how many gallons of chlorine you dump into it the water is still murky, it can be done. Whether you have a salt-based pool that produces chlorine or you have a tablet- or liquid-based chlorine pool, keeping your water balanced is key to its health. Water that’s out of balance can irritate your eyes and skin; not kill the pool’s bacteria and even be harmful to the actual pool itself – corroding hardware and even the pool pump. So while it’s not cheap to maintain a pool, it’s far more expensive to neglect it. Ready to get scientific? It’s not organic chemistry, but you might be able to impress a 5-year old. Basically, a balanced pool means that the pH and chlorine levels are where they need to be. The chlorine slays bacteria and germs while the pH measures acidity and alkalinity. Twice a week, use a water testing kit to measure both of these levels. Optimal chlorine levels are between 1.0 and 3.0 parts per million; the pH level should come in at between 7.2 and 7.6. Low chlorine levels mean you need to add chlorine until the reading shows the right amount. If the pH is high, you can add either muriatic acid or sodium bisulfate, both of these are common and effective types of acid. But don’t get them near your clothes! For low pH levels, sodium carbonate is an alkali that will reduce the acidity. As your filter is busy sucking up small particles, it won’t be able to siphon out larger debris, like leaves and other organic matter. It’s important to skim your pool’s surface as often as possible before all this stuff begins to break down and cloud your crystal-clear water. Along with skimming, brushing and vacuuming is important too – especially for preventing algae blooms to form. Battling algae is no fun, so incorporate the skim, brush and vacuum maintenance into your regular routine to keep your water in tip-top shape. Even with perfectly balanced chemicals, algae can still sneak up on you and wreak havoc on your pool. Anyone who has maintained their own pool long enough has likely experienced this frustrating scourge. Not only will shocking your pool help kill algae but it will get rid of any lingering bacteria, too. A weekly shock treatment is a small price to pay to avoid dealing with green walls and unhealthy water. Be sure to apply the shock after the sun goes down and while your pool pump is running. Keep the pump running for about eight hours after you apply the treatment. You can pick up a shock treatment from a local pool company. Since your pool filter plays a big role in pool water cleanliness you want to make sure it’s taken care of as often as needed. Depending on the type of filter you have, your maintenance routine will differ. People with cartridge filters have it a little easier as they only have to clean their filter every three months or about four times per year. This is a great option for people who don’t particularly love maintaining a pool – you can skip out of a lot of extra work with cartridge filters. Those with sand filters, on the other hand, need to backwash those filters at least five times each month to keep them in solid working order. This is not for the faint of heart as a dirty filter can translate into even more work down the road. You’ll know it’s time to clean your sand filter when the pressure has increased by more than 10 psi of its normal levels. Simply check your pressure gauge regularly, every few days, to see how it’s doing. 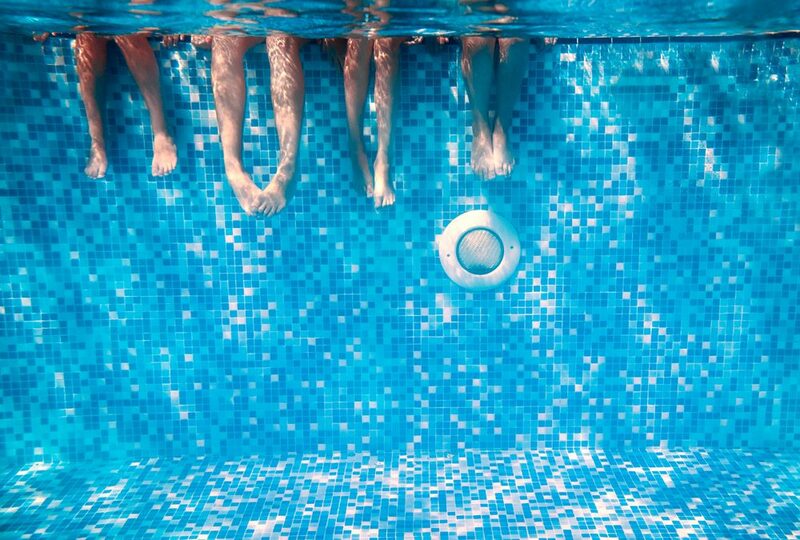 Even though your pump is still doing what it’s supposed to, a higher pressure reading means that your filter isn’t working at the most efficient level – slowing down the amount of water that goes back into the pool. Now that you know the basics of keeping your pool swimmable all year round, you can avoid the scary green moat some pool owners, unfortunately, end up with. Copyright © 2017 Reflection Pool Service | Designed by Mighty Fine Design Co.